We all know that colonists in Williamsburg, Virginia were good at churning butter and modeling their tri-cornered hats. Turns out, they were also good at sending Valentines. In the late winter and spring of 1768, Virginians turned their attention away from heightening tensions with Britain and focused on the very public declarations of love published in the local paper, the Virginia Gazette. But these were no ordinary love poems. These were acrostically written valentines, where the first letter of each verse spelled out the young lady’s name. Sweet lovely maid; dear fav’rite of the nine. Say, will you be my constant VALENTINE? Rears her fall’n pow’rs, and strikes the trembling strings. Extatic raptures all my heart entwine. Lovely like you—like you was form’d to please! Wither’d my joys and snatched the beauteous dame! Say you’ll be kind, or youthful Strephon dies. Here was the youth culture of the day, centuries before Facebook made it possible to change your relationship status, making public displays of love and adoration. Most praise the gaudy tulips streak’d with red. As o’er the stream he bends to view his face. E‘n thus fares beauty in each lover’s eyes. She like the rose was made, all eyes to please. This poem seemed to tug at the heart strings of the readers of the Gazette so much that the newspaper made a point to announce the marriage of Mead and Waters three months later. The Virginia colonists were hooked. 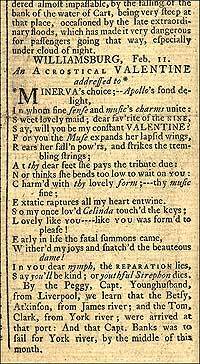 Poems and other examples of romantic puzzles and word play dotted the columns of the Gazette for the next several months and became hugely popular. While the trend dissipated over the next few years, I love thinking of those love-sick tri-corner hat-wearing young men scratching out their poems with their quills, hands covered in ink, and the excitement of the young ladies who saw their names in print. 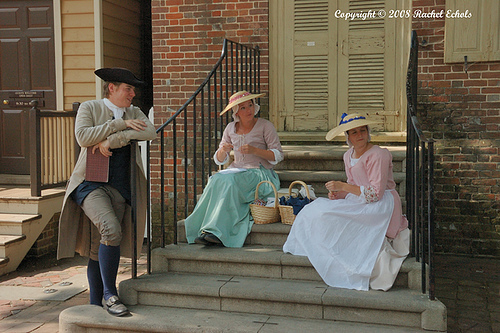 For more, read this in-depth article from the annals of the Colonial Williamsburg website.